One of the reasons we rented an RV was so I could cook our own food. 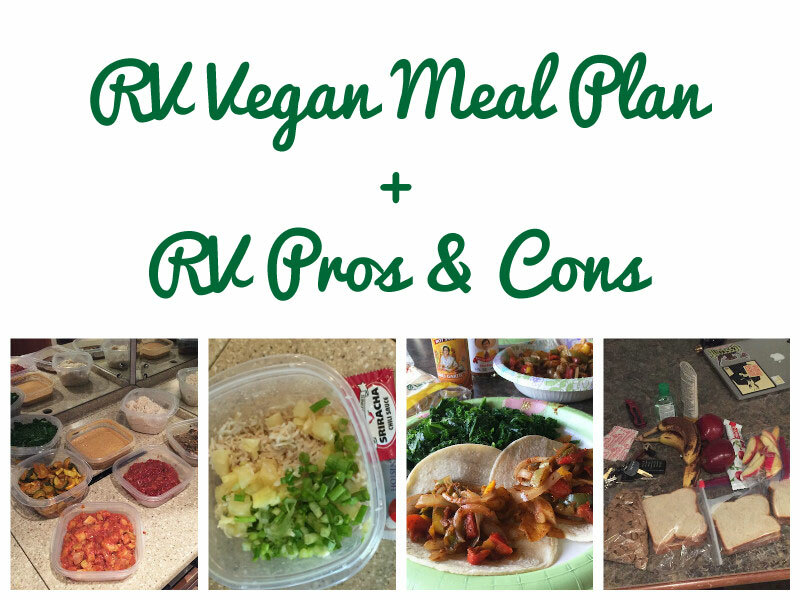 Creating our RV menu was a pleasant reminder of how many HH recipes use mainly pantry staples! When sitting down with my cookbooks and past meal plans, I had way more options than I realized -- I started having trouble narrowing down what to select because there were so many good options and favorites!!! My strategy: Select recipes and meals with similar ingredients so I could bring the least amount of spices AND to avoid ingredient waste. I also relied heavily on recipes involving rice, potatoes, squash, and vegetables that do well without refrigeration (like zucchini and cherry tomatoes) since the fridge and freezer were so tiny. I even planned our meals so we ate the freshest ingredients first, then moved on to recipes involving frozen and dry goods! Just like at home, I was a batch cooking bad@$$ in the RV! I found I preferred cooking in my pressure cooker (I use the "saute" and "simmer" features as a make-shift stove) more so than the camping burner, but both worked. The microwave got a workout with my potatoes! Batch cooking ensured we would always have good food after a long hike. There was no waiting an hour for a table at some crappy restaurant, OR me having to put in effort when I was already exhausted. Just reheat and eat! Batch cooking is AMAZING guys, do it!! Seriously, use the meal plans or create your own system. This trip was a testament that if you don't plan, you plan to fail! PLUS when I realized just how hot and stuffy it got in the RV when I cooked anything, I was SO GLAD I wasn't going to be doing that nightly or daily! Heat up a bag of frozen mixed bell peppers with sliced onion in a fajita seasoning and place in tortillas with hot sauce! And Scott loved my pineapple rice so much he started taking it on hikes! Rice, canned pineapple, soy sauce or teriyaki or hoison--glad I started saving all those take-out packets! plus cilantro and green onion if you have it. or kabocha squash (which I love and is ridiculously cheap at Trader Joe's right now!) with an apple and carrots. And discovered this amazing new breakfast courtesy of my PC! I love a good banana or tomato sandwich! Yes I had my mustard packets! I hope this post has given you some inspiration for YOUR camping adventures! P.S. Meal Mentor members: There's a new ebook with my exact menu, plus all recipes, and a shopping list!! in our exclusive member library, along with the travel plan that's already there (plus don't miss the camping information in the forums). 1) You can settle in and stay settled.There's no constant packing and unpacking. No carrying everything to and from the car every few days. No long process of setup or breakdown, or trying to fit everything in the car (again). No living out of a duffle bag and dealing with the... "is this dirty?" and "where the heck is?" You save a lot of time being able to roll in, roll out and be organized! 2) You can bring more. There's a lot of storage space in an RV, so you can bring more clothing (and avoid laundry), more dry foods (and avoid shopping), more gear or whatever (and be ultra prepared!) than you ever could in a car. You also won't have to live on top of all your stuff. No crazy clown car! 3) You can cook.This was the biggest upside for us and I made great use of our little fridge, stove and microwave. Being able to cook make the entire trip so much more enjoyable (less stressful) and easy. Eating well also helped us recover faster and feel ultra energized! 4) POTTY!If you're a member of the Small Bladder Club, you get me. 5) Electricity.I was thankful to have tons of outlets and plenty of light. 6) Comfort. An RV takes you from camping to "Glamping" with a real mattress bed, AC, even a TV! No camping chairs and air mattresses! 7) Weather. Piggybacking on #6, it's about a million times better to be in an RV when it's raining, snowing, freezing cold, or really hot. Even though we had stayed in the same general geographic area, we experienced it all: below freezing temps, hail, down-pouring rain, crazy high winds, mud (and more mud), and scorching heat well over 100. I was really glad to be inside an RV and not in a tent or rustic cabin with the more extreme weather AND going back to #2, we also had the space to pack more blankets, winter-y clothes, rain boots, which would have been sacrificed if we were driving a car instead. 8) Pets!It's a lot easier to travel with pets if you have an RV, especially if you plan to hike or spend time walking around. Dogs aren't allowed in most parks or on the trails, and you can't leave them in your car, cabin, or in a motel room unattended, but you can leave them in an RV if you run the generator! 1) Expensive. In addition to renting the RV, you also have to pay to camp each night (about $60 per night average) and you'll use a lot more gas. 2) SLOW.You can't drive an RV very fast (both for safety and lack of horsepower). If the distance is a 3-hour drive in the car, it's at least 4 hours in the RV without stops. There's also a lot of roads you can't take RVs on because of height or weight restrictions, so you often have to go around your elbow to get to your bottom, making the journey even longer. 3) You can't stay IN the park.Most campsites inside our National Parks are for tent camping only. RV campsites are typically outside the parks, usually 1-3 miles away, though sometimes longer. Most campsites do not offer shuttle service to the park, or even have bike rentals, and there's no public transportation or uber, so getting TO the park becomes a challenge. We had to hitchhike a few times, especially when we wanted to stay for sunsets. 4)You can't "drive." Most of the parks aren't just car-friendly, they are car mandatory. You need a car to be able to drive around the park to get to the various viewpoints (or trails). Some parks do have a free shuttle once you're inside the park, which helps, but you still won't see as much or have as many options if you could drive yourself, and you can't drive your RV. The roads are often too difficult for the RV, or there is no parking for an RV if you want to get out and take pictures or hike, or they don't allow RVs in the park, period. I would not RV again without a bicycle to help get me around. While some parks don't allow bikes inside, and some parks would be incredibly difficult for a bike, the bike would at least be helpful in getting you to and from the RV campground. 5) RV maintenance. You'll have to dump (get rid of your waste) every couple of days, and deal with water and electrical hookups every time you arrive and exit a campground, but it's really not a big deal. Mostly plug and go. Pitching a tent is way more work. 6) You're an obvious tourist.Most rental RV are driving advertisements (kinda like u-haul vehicles) which isn't a big deal, but I tend to like to blend in and not draw attention to myself. Will we rent an RV again? Maybe. Would we do it differently in hindsight? Probably not. There isn't a clear better solution, just a different option with its own sets of pros and cons. When making the decision to RV or not, it really depends on what you want to do on the trip, how you plan to spend your time, and what your needs and deal-breakers are. What inconveniences can you stand?? I hope this post (and the entire RV series) has been helpful to you and if you have had experience RVing, please leave a comment below.